As I stood in front of my students using the Smartboard, as I walked around the room while they completed their math journals, as I called them up to the board to manipulate coins, I knew they were just not getting it at all. Have you ever seen those blank stares? Have you ever seen poor lost little souls looking at you like you have four heads? Yup. That was last Wednesday's Math lesson. It's one of those moments as a teacher that I dread. They. Had. No. Clue. I walked around helping each student complete their math journal knowing I had to rethink this one. As is typical, there were those that truly "got it" and there were those that were almost there, and then there were those that were just completely lost. It's those kids I empathize with. The truth is - I hate math. I hated it as a kid, and I hate it as an adult. I'm just not good at it and I never was. Perhaps I have developed a bias against math. Nonetheless, I feel for those kids whose minds just don't jive mathematically. So when a colleague told me about the TouchMoney Program at first I thought (ignorantly) oh here we go....another abstract, complicated, and confusing model to teach these poor kids to only confuse them more. I'm so glad to say - I was wrong. I have an enormous amount of respect for Jenn. She's an incredible teacher so I decided to give it a shot. I will never teach money the same way again! Ya'll this technique rocked our world over here in Room D156. They got it! The next day, after recess I introduced TouchMoney. Ya'll.....their faces changed from the blank stare to the "Ohhhh I geeeeeeet it!" And suddenly I stopped feeling like the world's worst teacher. In order to succeed with Touch Money students must be able to count by 1's and 5's to 100. They also need to be able to know the name and value of each coin . Here's a link to a fabulous 3 minute video that explains the program. 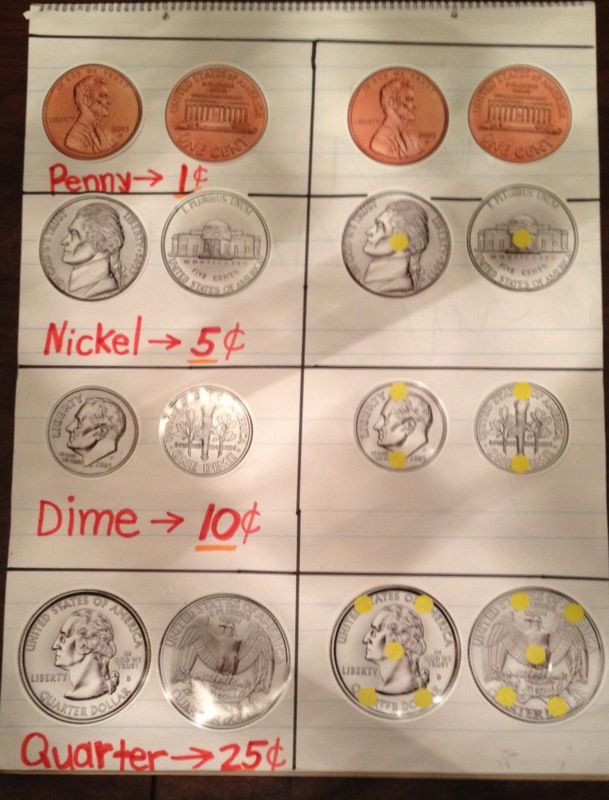 I went to the dollar store, purchased large paper coins for a buck to make my anchor chart and we were on our way. The premise behind the Touch Money program is that all coins (except the penny) can be counted using 5's. These are TouchPoints. Therefore, a nickel has one TouchPoint because it's worth 5 cents. A dime has 2 TouchPoints (it is 2 counts of 5) and therefore, it's 10 cents. A quarter has 5 TouchPoints with each TouchPoint being a count of 5 to make 25 cents. I love the visual, concrete, and scaffolded approach of the TouchMoney Program. My students have shown tremendous growth and success with this method and I will never teach counting money another way again!